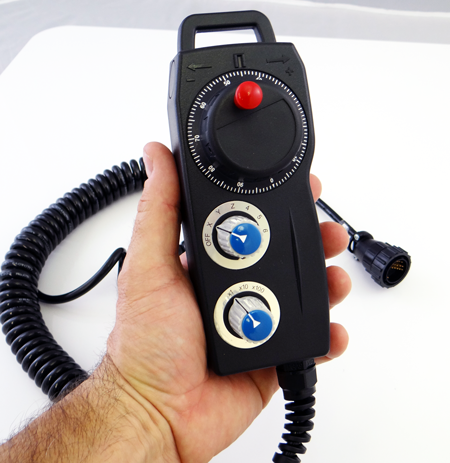 Use the Manual Pulse Generator to jog the machine tool, very useful for part and tool setups. Remote coil corded MPG handwheel allows you to jog an axis one step at a time. Selectable x1, x10, x100 movement per increment. .0001" per increment is the finest increment. Great for touching off and setting up tools and part zero positions on large machines. Tough ABS plastic body with individual selection knobs for each axis and increment amount. 100 pulses per revolution for fine control. Ergonomic design that is easy to hold. Come with convenient hanger which can be mounted on the control or anywhere it is convenient to store the handwheel when not is use. Order with or without internal bulk head cable. If you have a factory built M400/T400 CNC control or if you ordered the CNC console conduit cable kit you do not need to buy the internal bulkhead cable. If you are building a DIY CNC control based on the Oak cnc controller you will need the internal bulkhead cable to connect this MPG to the Oak board. - For use with Allin1dc and Oak CNC control boards. - Plug and Play with Oak/Allin1DC cnc controls.